There's no better audience for this movie than SXSW attendees. Warner Bros. debuted a secret Ready Player One screening at South by Southwest (SXSW), a multimedia entertainment festival in Austin, Texas that’s long been a haven for the tech-obsessed masses. You couldn’t find a better audience more primed for this movie out there than the gloriously nerdy hordes of SXSW attendees. As such, early reactions from fans and critics alike are almost universally positive, with some already calling it a masterpiece. The secret screening of Ready Player One happened on Sunday night of SXSW and not even technical difficulties could dampen reactions because it was still met with a standing ovation, which just goes to show you how much the audience loved the movie. Ready Player One, based on Ernest Cline’s novel of the same name, follows the young Wade Watts in a poverty-stricken dystopian future in which most people escape to a digital VR world known as the OASIS. After the game’s creator dies, he releases an epic contest that will allow anyone gain control over not only the OASIS itself but also an incredible fortune. Members of a nasty corporation will kill to win the contest and fortune for themselves, but Wade Watts is among the many expert gamers hunting for the prize all on his own. Innovative Online Industries (IOI) in 'Ready Player One' is peak corporate villainy. This classic “nerds vs. capitalism” premise feels so Eighties, especially when the film itself is chock full of Easter eggs, homages, and pop culture references from that era. 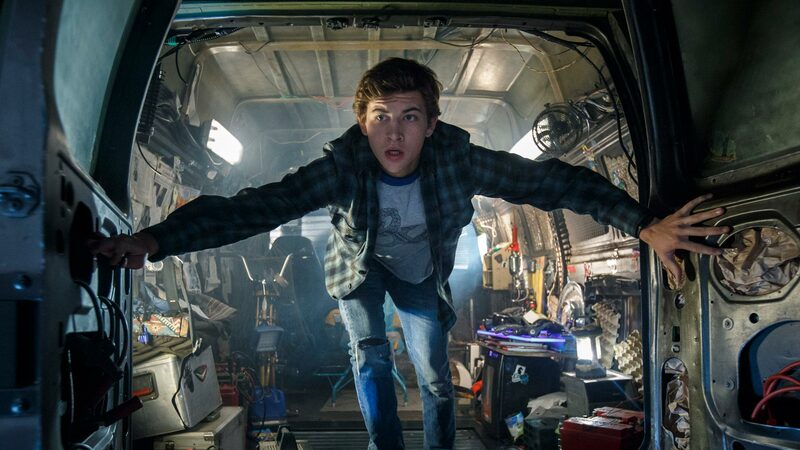 Charlie Fink with Forbes is the one already calling Ready Player One “an instant sci-fi masterpiece,” saying that it’s “a great big lovable mess of a movie” that “will be revered by science fiction fans for generations.” This sounds a lot like most reviews you might see about the book, but interestingly, the movie veers pretty far off course in doing its own thing. Writing for The Hollywood Reporter, John DeFore noted that Spielberg’s movie “makes big changes to the specifics and structure of Ernest Cline’s best-selling novel but keeps the spirit and level-up thrills intact.” Cline himself co-wrote the screenplay, and the changes seem to improve the tale for the big screen, making it into a dazzling CGI-filled spectacle. All this praise for Ready Player One feels almost hyperbolic. Again, Warner Bros. couldn’t have brought together a better first audience for this movie if they tried. So there’s no telling how the film might fare when exposed to a more diverse audience, but this is Spielberg after all, so maybe we have every reason to get more and more excited for when the film finally hits theaters. Ready Player One will be released in theaters on March 29.